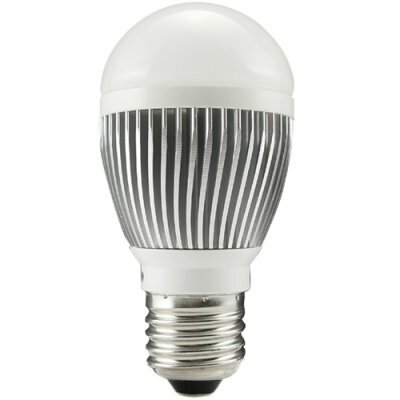 Successfully Added LED Light Bulb - Warm White (3W) to your Shopping Cart. After many months of careful research and study we are happy to finally bring you our own selection of white LED lights. These are compact sized light bulbs (often called LED lamps in the trade) that will fit into any standard incandescent lamp socket. Our G07 model produces a warm white color light and measures a mere 100mm by 55mm (L x W), making it suitable for placing in practically any size/shape lighting fixture. The design and manufacture of these LED lights is beyond compare - from the all metal primary housing and die cast cooling fins to the IC boards that drive the diodes, every part has been manufactured to exceed world performance standards. You simply cannot find a better built compact-sized 3 watt screw in LED light bulb than the G07! Great for retrofitting into existing low wattage desk lamps, wall sconces, multi-lamp pendants, these warm white LED light bulbs deliver smooth and uniform light distribution without any flicker. In addition, these LED lights provide particularly good eye friendly task lighting for computer desks. Chinavasion offers this LED light bulb with full QC testing before shipment ,so you can try one for yourself to see how it works. Then you can stock up on this new LED lamp to sell at your online / physical store or feature it in your latest eBay, Amazon or uBid listings. True professionally designed lamp casing (heavy gauge all metal curvilinear design), not plastic like the cheap lights on the marketplace today. These L.E.D. bulbs cannot produce the same amount of light as a 100 watt incandescent light bulb. They work most satisfactory when used to replace low wattage bulbs in desk lamps, wall fixtures, or multi lamp pendants. True professionally designed lamp casing (heavy gauge all metal curvilinear design), not plastic like the cheap lights on the marketplace today. This is important - most LED's in the market today use plastic casings that will only last a few months before degrading, the G07 has an all metal design that will give you years of reliable use. I would say its the equivalent of a 30 to 40W normal bulb. Runs very cool and after 2 hours of being on you can still touch it. So ideal in Kids bedroom, especially as they always forget to switch the lights off. Good light, though its somewhere inbetween a CFL and normal bulb in colour temperature.